To think something not associated with heat, I would like to write about typical summer fruits served chilled; watermelon! 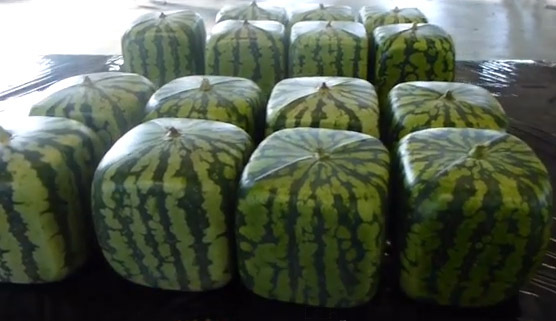 I assume some of you may have heard that we grow square watermelon in Japan. It seems it’s typically approx. 18cm on a side and costs over 10,000 yen (over US$102), and it is generally used as a decoration of shops such as fruit shop in summer. But I’ve heard that now this square fruit is exported to Russia and other countries from Japan. Interested to know how it is produced? It seems squared watermelon is placed into a plastic square container when it is small, so that it will be proper square when it is big enough to fill the container! Well, it sounds easy but that’s all I hear about it, so there may be other difficulty to grow one?? I cannot say anything as I haven’t owned or tried the square watermelon myself, but surprisingly, it seems the special watermelon is not as tasty as round one despite the price!! This is due to the fact that it goes to the market when watermelons fill the container to be perfect square, but not ripen enough to be enjoyable.